Pruning, camaraderie, spades, pumpkin soup, wheelbarrows, workshops and a tremendous feeling of satisfaction await you on Saturday 12th July as we hold another remarkable Food Forest Permablitz with help from the amazing Permablitz Collective. Help get months of work done in a day, learn stuff and have a laugh while you're at it (PLUS we'll provide lunch for everyone who comes to help). Where: Dunstan Reserve, West Brunswick - enter from Everett St through the car park beside Moreland Child Care Centre, 51 Everett St. This amazing food forest with 30+ mature productive food trees and a slowly developing under-storey of edible and companion plants is a terrific companion to the community garden next door provides a long-term, perennial counterpart to the garden's mostly seasonal, transient, plant-harvest-replant cycle. This unique place will only get better as it becomes more established and we invest some love and attention. hold some short workshops on things like pruning and composting. Never been before? Come and check it out. If you came along last year, come and see how much the food forest has grown and developed over the year and to bump into the people you met last June. Do you believe that Melbourne can have a food system that is healthier, more sustainable and fair for all? So do we. We also believe that there are ideas out there that could transform the way we produce, distribute, prepare, share, sell or consume food - contributing to a thriving local food economy for Melbourne now and into the future. Join us at the Local Food Project Big Ideas Jam on Tuesday 24 June, with others who are passionate about better food futures, to develop what could be the next world-changing idea. This event is a follow up to the EcoCity Food Forum in 2013, and the Going Local Forum earlier this year. The Local Food Project Big Ideas Jam is part of a program we're currently developing with City of Melbourne, The Food Alliance and the Open Food Network, which includes a Prototype Design Camp 25-27 July, and a Project Accelerator program over 10 weeks starting in September. Through the Local Food Project Launchpad program of events and activities for 2014, our aim is to provide a launchpad for six Melbourne-based local food initiatives, and support the development of dozens more Victorian sustainable and fair food initiatives, and the passionate and innovative people who are driving them. Join us for the Going Local Big Ideas Jam on Tuesday 24 June at State Library Victoria, and you will have the opportunity to share, develop and test ideas with teams of diverse, knowledgeable and experienced people from across the food sector - from growers and distributors to restauranteurs and educators, from policy-makers and community service providers to entrepreneurs and creative professionals. Join us for a fun and exciting evening that will see up to 20 teams come together, and 20 big ideas designed and delivered in just two hours. You’ll also hear more about the Local Food Project Prototype Design Camp 27-29 July, and what else we have planned for the rest of the Going Local Launchpad program for 2014. Growing Food Project: short documentary now online! The Growing Food Project is now available to watch online! Thanks to all the amazing people who have inspired this piece and featured in it, the great crew, Pozible supporters & everyone who attended screenings and supported us over the past few months. Growing Food Project from Rasha Tayeh on Vimeo. For more details visit the Growing Food Project website. In 2014, the Victorian Schools Garden Awards is pleased to introduce a new Grants Program. This program is designed to provide seed funding to schools to establish new gardens. This funding program will be held in tandem with the Awards program, which recognises existing and new school gardens and the achievements of students and the school community in school gardening. Grant applications are now open and will close at 5pm on Friday 27 June 2014. Applicants will be notified by 18 July 2014 of the success of their application. 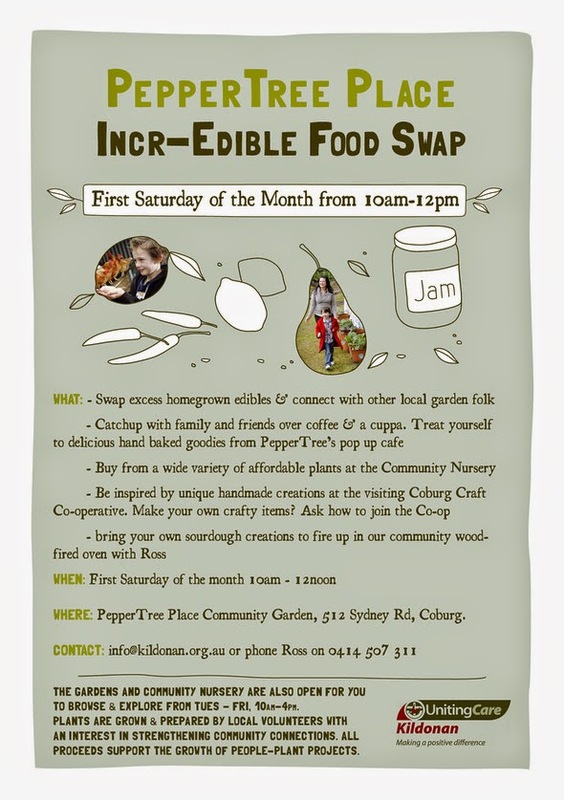 This Saturday the Incr-Edible Coburg Food Swap is on!! 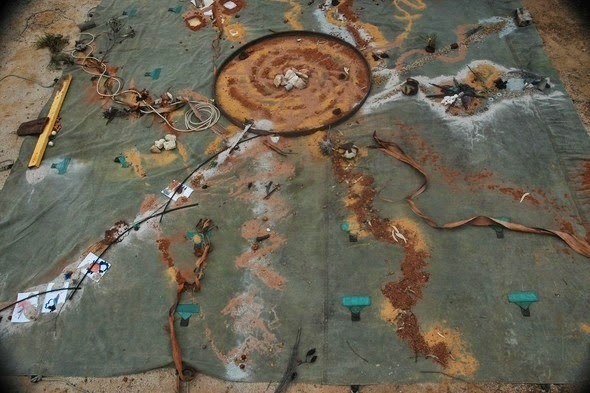 This month will feature as part of Reconciliation Week and indigenous cultural exploration - Connection to Country - an indigenous perspective of spirituality, connection to land, nature, food, music and living it locally. This has been brought to you by a wonderful partnership with the Multicultural Women's Sewing Group who have weaved their magic over the last two years and have featured different spiritual and interfaith celebrations hosted here at PepperTree Place. We will have hand made damper for you and your kids to cook over a fire, music, string making and stories and an open discussion on indigenous culture, art, history and perspectives. This activity is all free and you're all welcome! Ross will have the wood fired oven cranked and happy to take on board your home made doughy creations once again with sweet treats, great coffee and tea available from our pop-up cafe. Come and browse our affordable range of plants form the nursery that await your tender green thumbs. Bus and Tram stops at door; heaps of bike parking.